The process of glass blowing is long , hot, and arduous and would take far too long to write about here, but I can heartily recommend visiting a glass blowing factory and seeing it in action if you ever get the chance. Glass colouring and colour marking may be obtained by the addition of colouring ions,by precipitation of nanometer sized colloides (so-called striking glasses such as “gold ruby”or red “selenium ruby”), by colored inclusions (as in milk glass and smoked glass), by light scattering (as in phase separated glass), 5) by dichroic coatings (see dichroic glass), or 6) by colored coatings. I went to The Alum glass blowing workshop at The Needles in the Isle of Wight, and was amazed at watching the whole process. Sulphur is used with Iron (Fe) and Carbon (C) to produce amber glass, the colour of which can vary from very light straw to a deep reddish-brown or even black. Under the strongly reducing conditions created by the carbon, iron polysulphides are formed and these give the required depth of colour. Which is what was used in my little glass cat that I bought there. Posted in 366, art, cat, colours, Fuji, fujiXT1, photography, still life, uncategorisedTagged 366, art, August2016, Cat, colours, day237, fraggle, Fuji XT-1, glass, glass blowing, photography, still lifeBookmark the permalink. You can always go on 😊 it’s nice when a photo brings back someone’s memory. Did you keep the glass beads? 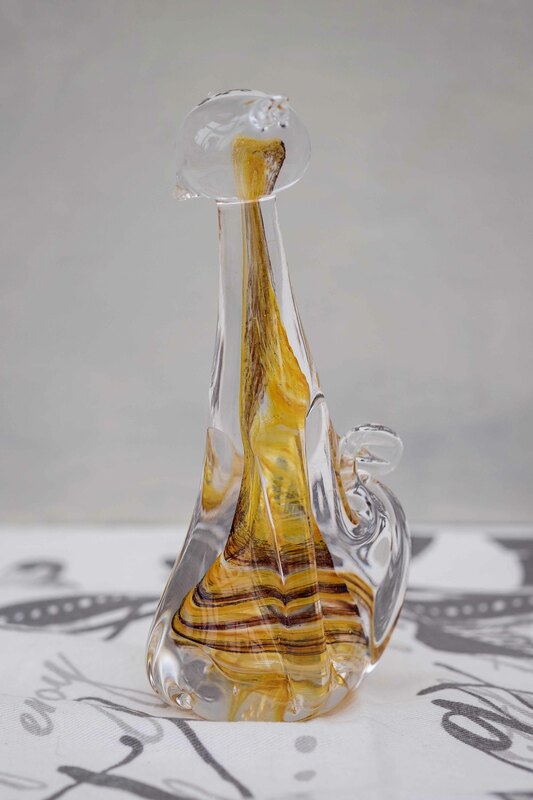 I got to blow some glass once (my friend’s father owned a shop) and it’s very cool but I really appreciated how intuitively the artists could shape something. I remember all those years ago at school. The metalwork teacher showed us how to make a glass-blowing tube. I could hardly get a puff down it! It is very talented indeed, and the colour combinations are generally unusual. Nice idea, FR.